The leading independent specialist for windscreen replacement and windscreen repair based in Maidstone and serving all of the Maidstone area. National Windscreens Maidstone fitting centre provides windscreen replacement and windscreen repair services to businesses and individuals throughout Maidstone and the Maidstone area. The Maidstone fitting centre is is located North West of the town on the River Medway in Kent. It is very accessible by road, being situated on junction 5 of the M20, which links with the M26 and M25 to London and to Folkestone in the South. 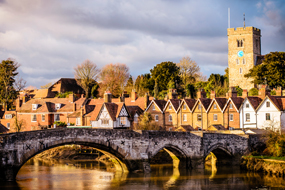 The Friars Priory in Aylesford is a main attraction - dating back from the 13th century, it attracts thousands of visitors every year. The Maidstone windscreen fitting centre and its mobile vehicle glass technicians service the needs of Maidstone and the surrounding area including Aylesford, East Malling, Coxheath and Sutton Valence. With 108 fitting centres and over 800 mobile technicians, National Windscreens operates the UK's largest windscreen repair and windscreen replacement network. The company provides low cost, high quality windscreen replacement and windscreen repair from its Maidstone fitting centre 24 hours a day, 7 days a week, 365 days a year. Repair and replacement of all types of vehicle glass including windscreens, rear windows and side windows is undertaken throughout Maidstone and all of the Maidstone area.